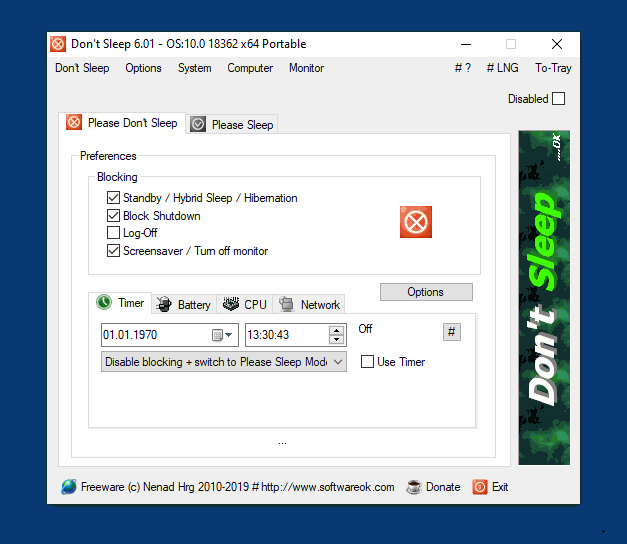 DontSleep is the ultimate freeware tool that prevents the new Windows 7 and 10 to goes standby, shutdown or hibernate! Download : ... "Don't Sleep" Download! Screensots : ... "Don't Sleep" Screenshot! Prevent remote shutdown windows 7? How to avoid a windows 7 shutdown? How to stop remote shutdown windows 7? How to find program preven? Prevent remote restarts windows 7? Dear Sir/Madam, I have been having a terrible problem with my new i7 Desktop where no matter how many times I set it in power options to not turn off display after 20 mins it randomly reverts back to 20 mins from my setting of Never. I find my monitor off and this makes my pc un responsive and mouse and key wont wake it so I have to hard reboot. Is this software a remedy for this and will it help me? Disable shutdown in windows 7? Firefox preventingwindows from shut down? Stop prevent Windows Remote Shutdown Windows 7? Prevent shutdown windows 7 home edition?